I don't know if anyone can truly grasp how large these numbers are. If we could travel at the speed of light, we'd be there in a mere 29 million years. And at that speed it would only take 50,000 more years to get across it. Mind boggling. What about the 800 billion suns? How do we even begin to comprehend 800 billion of anything? Let's say you write a short story of 250 words on a page of paper, and you use mostly small words so that the average word is 4 letters. That's 1,000 letters on the page. Now let's say you write 1,000 of these short stories and create a thick book of a thousand 250 word stories. Your entire book would have 1 million letters. Now imagine having a library with one thousand of these books. Your library would contain 1 billion letters. Finally, imagine having 800 of these libraries. Add up all the letters on all the pages in all the books in all the libraries, and they would be equal to the number of suns in the Sombrero Galaxy. 800 billion. 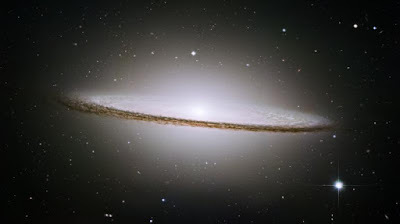 And the Sombrero Galaxy is just one of billions of galaxies in the known universe. It truly is beyond my comprehension.